Find out about a one dimensional world of cells. 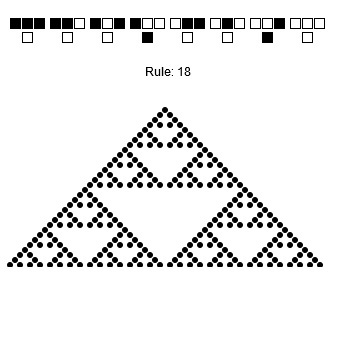 Read about Elementary Cellular Automaton at MathWorld. Each cell determines its state in the next generation by looking at itself and then looking left and right. Cells must be in one of exactly two states. Each cell must either be on or off. In this picture cells that are in the on state are marked with a black circle and cells that are in an off state are not marked at all. Rule 18 says that if a cell is off in the current generation and has a cell to its left or a cell to its immediate right that is in an on state then it will be on or marked with a black circle in the next generation. 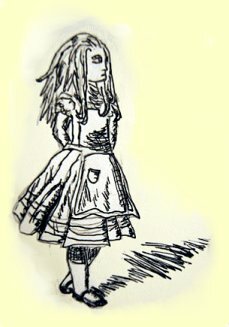 Alice is intrigued by such lovely pictures created from such simple rules and wonders what might happen if we projected the image in another way. She reasons that in one dimension there can only be left and right or up and down but never both. Maybe the key to understanding a single dimension is to not confine ourselves to a two dimensional grid. What would happen if we imagine the automaton radiating out from a pole instead of progressing down the page? 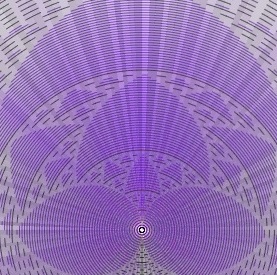 We would still see the workings of the cellular automaton in two dimensions but things would certainly look different.